Ok, so I'm rubbish. But in my defence, it's hard to write a travel blog when you're not actually travelling. Especially when I'm working for quite a lot of the time. Not that my day to day life isn't interesting but...it's now become my day to day life. Bonfires on the beach aren't a novelty, they're something we do when the pub gets too expensive. It's quite nice being a backpacker but still being able to go 'home' for Christmas. I'd met quite a few people who were plumbing relatives thrice removed in order to have a nice homely environment to eat their turkey in; having a Mum a mere 240km away was something many were jealous of. Still, it was with a bit of a heavy heart that I left Mission. Knowing that when I returned I'd only have a week and a half before I said my final goodbyes wasn't a nice feeling. Not that it mattered when Mum picked me up from the bus station, nothing in Mission can compare to a big Mummy Beckett hug. Fact. Christmas didn't really feel like Christmas, which I think made it easier for both of us. It's hard to get into the spirit when the palm trees have lights on, and there isn't a big Eastenders misery fest to look forward to. In a way I was glad - I think both of us would have felt a lot more lonely had we really felt like the festive season was upon us. Unfortunately Mum had to work the night shift on Christmas eve, so I accidentally drank a bottle of red to myself and got angry about this. Then, ever the optomist, I popped on some Buble and got to work 'Christmassifying' (that's a technical term) Mum's new house; she'd only been there for a few days and had been working constantly so I added some Cheskie fairy dust. And teddies wearing hats. Being the model daughter that I am, I woke up early to switch on all the lights. (Fire safety concious but also keen for Mum to arrive home to an Aussie Christmas grotto.) When Mum had slept for a few hours we both woke up again to discover that Father Christmas had left me a stocking! It's almost like he knew that I'd be slightly sad away from home, but also in need of many toiletries. Thanks FC, toothpaste is pretty darn pricey out here. The lovely Mick and Val had invited us over for Christmas lunch which we were very excited about. Meat was cooked on the enormous barbie, and we had a bowl of massive prawns. Hello Australia, I like your Christmas dinners! After a swim in their pool and a walk along the beach Mum and I headed home for a family skype. It was a very hard day of eating and drinking, so we just about managed to watch When Harry Met Sally before dragging our bottoms into bed, and sleeping very soundly. Seeing as I've worked almost all of the NYEs in my adult life, I didn't mind working another one. In my experience you generally get paid to get drunk with your friends which sounds like (and generally is) a pretty good deal. We rang the New Year in with a rendition of Auld Lang Syne (my doing) and lots of alcohol (partly my doing), then clocked off and heading to my friend's place for a shindig. I was determined to see the sunrise and managed to pace myself, just. At 5am I headed down the hill with two of the skydivers (Rob and Clem) and a bag full of booze. At one point I ws stood knee deep in the bathwater sea, watching the sun streak up and I just started laughing. How did a girl from Tamworth find herself seeing the first sunrise of 2012 on a tropical beach, the beach that she lives next to? That's what happens when you order a round of tequilas at 5.30pm, Dave. And to think I had to wash it down with a hangover-curing bloody Mary. We continued in a similar vein for the next few hours, with the shots getting ever-more disgusting. 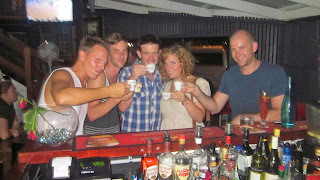 I think the barmaid's coup de grace had to be the espresso/sambuca/kahluah concotion. It tasted genuinely offensive, but was so big that it took a couple of decent gulps. Mmm, made the taste spread nicely over my entire tongue. Suffice to say that I felt just great the next day. Although that was more to do with the tonsilitis that started to infect my body as I'd been quite sensible and stopped drinking at 1am. Jan 2nd, curled up in bed with the builders constantly nailgunning the broken roof felt like what my new years morning should have been. Sigh. "When shall we nailgun the roof back on?" "How about when Francesca tries to nap?" As anyone who has spent any amount of time with me recently will know, my little sister arrived in Australia on the 7th January. When I became able to count down the days rather than weeks, my excitement grew to slightly dangerous levels; I became concerned that she would be injured during my initial airport hug/rugby tackle. Thankfully I stuck to having a good old fashioned cry and hug. Tash was fine, having found herself upgraded to business class during her final leg from Singapore. I'd be pretty OK if I'd had seven hours of being served fillet steak, asparagus and tiramisu with a selection of wines in actual glass glasses. All my 'I flew with Emirates and they have LEDs on the ceiling so it looks like the stars' smugness had been roundly beaten, by a worthy opponent. Mum and I gave Tash a mini tour of Townsville, taking her to the top of Castle Hill and along the Strand before she completely passed out for a sleep. Waking her up after two hours was like trying to rouse a particularly pissed off dragon but between Mum and myself we eventually managed it. Declining our offer of a walk to a pub, we settled with eating our body weight in cheese and watching Outnumbered before Tash really couldn't stay awake any longer. Maggie looked beautiful in the sunshine, and after seeing lots of people swimming sans stinger suits we decided to take a dip. It was gorgeous, and made even better by swimming to shore with Tash - I've now officially been on Maggie island! After once again eating our own body weight in cheese, having a nap and drinking some more rum we had to motor back to Townsville. Tash was understandably a bit bushed but we dragged her to the local for a yummy Sunday roast before letting her sleep. - I'm irreplaceable, so no one had been found to fill either of my jobs. - I hadn't actually worked out a plan for Sydney other than 'get there'. - Right now, I think I'm more happy and content than I've been for a long time. I love Mission and I love my friends; I was pretty upset about having to leave them behind. - Stacey and Ash were planning to drive down to Sydney at the end of Jan. Long car journeys are easier with three people rather than two. - I'm still pretty poor, so three extra weeks of work wouldn't hurt. The new plan is to stay in Mission until Jan 29th, and then to road trip down over the course of a week to Sydney. I'm meeting my new BFF Pheobe in Melbourne at the start of March so I've got a month to play with (and hopefully to work a bit) before heading over, and as ever I'm flexible with my plans. Who knows? I'm like a cat, always landing on my feet. And purring when someone tickles my ears.